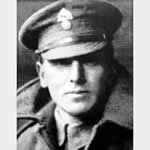 On 8/9 March 1918 west of Polderhoek Chateau, Belgium, Lance-Corporal Robertson having repelled a strong attack by the enemy, realised that he was being cut off and sent for reinforcements, while remaining at his post with only one man, firing his Lewis gun and killing large numbers of the enemy. No reinforcements arrived, so he withdrew, and then was forced to withdraw again to a defended post where he got on top of the parapet with a comrade, mounted his gun and continued firing. His comrade was almost immediately killed and he was severely wounded, but managed to crawl back with his gun, having exhausted his ammunition.